Jets are round-throated air amplifiers: one end provides a strong airflow while the other creates suction as free air is entrained. As the free air is entrained, jets amplify air volume up to 25 times more than the compressed air supplied, resulting in less compressed air usage to deliver the same or greater thrust performance. Jets are designed to reduce compressed air consumption and noise drastically as compared to open jets, copper tubes and iron or steel pipes without an engineered nozzle. Perfect for all types of blow off, conveying, cooling and drying applications, jets are available in a variety of high and low thrust models. 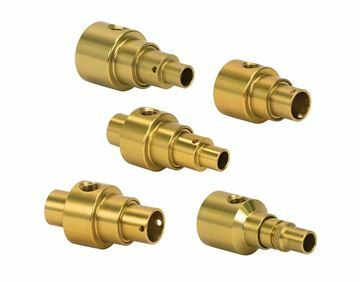 Since they output a more concentrated, targeted volume of air than nozzles, they are ideal for water, solvents or light oil stripping applications. Additionally, because they deliver a precise air flow, jets are ideal for parts movement and ejection, with a focused air flow targeted directly on the parts being moved or ejected. Vortec Jets meet OSHA specification for noise and dead-end pressure. Honeywell Solutions’ engineering team came up with an unusual use of Vortec’s air-flow amplifier in their application for the paper and pulp industries. When a Vortec product re-design would have required Honeywell to re-engineer their application, Vortec engineers developed a custom-design product for them instead.